Israeli soldiers shot, on Friday, five Palestinians with rubber-coated steel bullets, at the western entrance of Silwad town, east of the central West Bank city of Ramallah, during the funeral procession of a Palestinian who was killed by the soldiers a few hours earlier. 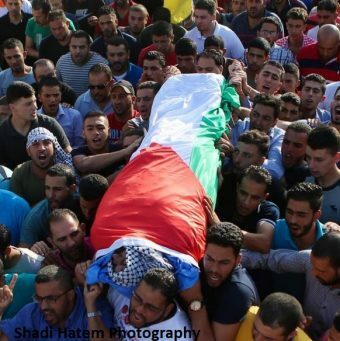 Local sources in Silwad said hundreds of Palestinians participated in the funeral of Eyad Hamed, who was killed by the soldiers at noon, at the western entrance of the town, after the army initially claimed “he attempted to attack the soldiers,” and later retracted his false allegations. The sources added that the soldiers fired rubber-coated steel bullets, sponge-tipped bullets and gas bombs at dozens of Palestinians, and cars, participating in the funeral procession, five Palestinians were injured and many cars were damaged.